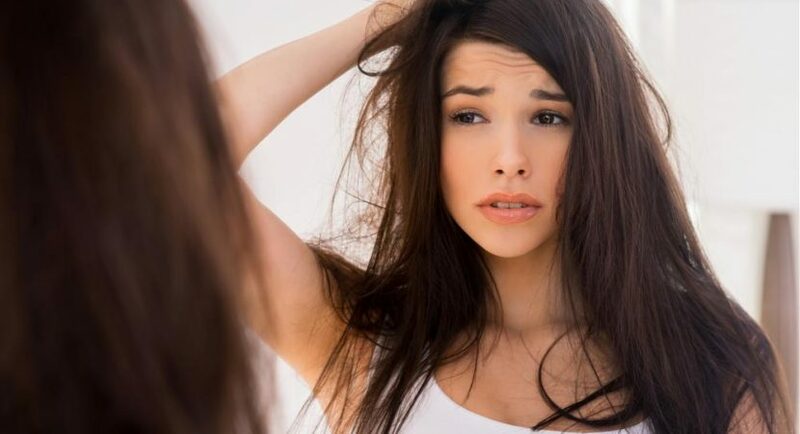 Dry and damaged hair are problems of many women. On top of that, frizzing and fly-away hair, that are difficult in maintaining, lack of vitamins and keratin, low level of water in inner hair structures and lack of gloss. How to deal with it? You can try long and extravagant hairdresser’s treatments. You can quit using blow dryer and straightener. You can stop colourisation and accept your grey hair. However, before you get to all of that, test some home made methods for dry and damaged hair. One of the best and tried by our grandmas method is use of apple cider vinegar. It can be both used on scalp and hair. What is the influence of apple cider vinegar on scalp? This product moisturises and provides gloss, but also prevents excess sebum secretion by sebaceous glands in skin. Introduce small improvement to your everyday conditioning. To bottle with atomiser, pour two table spoons of apple cider vinegar and two glasses of mineral or distilled water. Mix the entire thing and after each hair wash spray your scalp with it. To finish treatment rinse hair with cool water. Avocado can also help dry and damaged hair. It is because this fruit contains a lot of vitamins and minerals, which provide moisture and gloss. Therefore, you can make simple home made hair mask with avocado and olive oil. You just have to combine crushed fruit with oil, so that its consistency resemble formula of dragstore hair masks. Prepared this way cosmetic apply on damp hair and after 30 minutes wash your hair with shampoo. For final touch apply leave-in conditioner. Effective method for glossy, smooth, healthy and moisturised hair is hair mask with eggs. Properties of this product can be enhanced with few drops of castor oil to accelerate hair growth. Administer egg hair mask on scalp and hair and leave for 20 minutes. After this time rinse it and wash hair with shampoo and cool water. As a result, your hair will be regenerated, nourished and full of gloss. Replace your cosmetics with Aspirine!